A pastor asked me to give him examples of prayer being answered that I had seen, so that request developed into this summary. Prayers get answered in many ways, not always immediately, but sometimes it is immediate. We need to trust God. For 80 years I have loved it when we pray at home, personally or together. One night I was saying goodnight to a grandson, about 10 years old, who had a migraine headache. The Christian doctor had prescribed tablets to deal with it. I put my head on his head and prayed for him, led to say, “Infirmity get out in Jesus’ name.” I felt something happen. His migraines stopped and he has not needed the medication since. A student we prayed for one morning in our class went to her doctor that afternoon for a final check before having a growth removed from her womb. That afternoon her doctor could find no trace of the growth after checking with three ultrasound machines, so he cancelled the scheduled operation. We often pray specifically for one another in home groups, and see many prayers answered. We prayed for a young lady who couldn’t hold down a job because she was so slow at work. She then got a job as a helper in an old people’s nursing home. The matron kept her employed, even though she was slow, because she chatted a lot with the old people while caring for them and cleaning their room. They loved her extra time spent with them. A woman in our group had pain in her back. A nurse in our group was led to put her had in the lady’s back and simply pray, “L4 be healed, in Jesus’ name.” The pain left Lumba 4. “Can I take some bread home?” asked a tattooed young man at our communion service in the slums of Nairobi in Kenya, East Africa. God’s Spirit had prompted me to buy a few loaves of bread, bottles of drink, and plastic glasses for the congregation. We shared real drink and bread together among 30 people in their corrugated iron shed where I was the guest preacher. We prayed, as usual, a blessing on the bread and juice. Frank and his wife Linda then offered free bread and drink each Saturday for hungry, skinny slum people, usually catering for about 50 people. Sometimes many more turned up and they always had plenty. Apparently God kept multiplying it as needed. “What about the rain?” I asked. “God sent you, so he’ll do something,” they responded, full of faith. We prayed together. We drove for over an hour in the pouring rain from Accra, the capital, to the town of Suhum in the hills for our first meeting on Tuesday night. The heavy rain had flooded the power station there so the whole town was in darkness. We prayed earnestly, asking God to take over. Heavy monsoon rains began again the day after our meetings ended, so heavy we saw it reported on international TV the next week. We saw God’s Spirit move beautifully and powerfully in those meetings. Many were filled with the Spirit and healed. I heard a young man from one of their church bands praying eloquently in beautiful English – but he cannot speak English. They pray for one another with strong faith, expecting God to save, heal, deliver and anoint them. He does. He told us how his students and teams started new churches in villages and towns. They often faced angry opposition. One fanatical group burned their meeting tent and attacked them, hitting them with clubs, trying to kill them. They broke Paul’s arm and burned the tent. Suddenly handsome Indian men surrounded Paul’s team and miraculously moved them away to a safe place nearby. The team could see their burning tent in the distance. Those angels told Paul that God would send him back there. A few years later they were invited back and started a church there in a home. I taught on revival at a seminary in Manilla in the sweltering heat of the Philippines. An assignment I gave my M.Th. students was to report on revival and miracles. One Baptist pastor, who was also a police inspector, reported that a church he visited sent groups of young people to sing and speak at hospitals and nursing homes. One of those teams held monthly meetings in a mental hospital. The staff said that their patients may not understand much, but those patients did enjoy the singing. About 40 came to the first meeting. The team offered to pray for anyone who would like prayer. They prayed personally for 27 people. The next month when the team returned, all those 27 had been discharged and sent home. I visited China with a student from college. His parents worked there. The woman pastor-evangelist of a house church invited us to her church in a high-rise unit. The young man who met us at the gate could speak English. He feared that the security guard might ask awkward questions, but as we walked in around 7 pm, the guard had his back to us, talking to someone else. When we left after midnight, the guard was gone, probably sleeping. Around 30 people sat on the floor and sang softly in worship. We spoke and then found that no one would leave until we had prayed for them personally. That took a while! They were happy to slip away one-by-one, just as they had come. Most were new Christians who believed because a Christian prayed for their healing. They believed in prayer and miracles just as in the Book of The Acts. Their simple, strong faith and humility moved and challenged me deeply. One man we prayed for later than night also became the leader of another house church. They keep praying, and God keeps moving on them. We visited Elcho Island in the north where revival broke out and spread through Aboriginal communities all across northern Australia. We drove the 50k on dirt tracks to the north end of the island where a small community of 30 people prayed together every morning and evening. They prayed for revival. We joined them. They had seen revival begin after aborigines on Elcho Island prayed desperately for revival amid increasing crime, drink and drugs. The night their pastor, Djiniyini Gondarra, returned from a holiday they met of Bible Study and prayer in his home. God’s Spirit fell on them as they united for the closing prayer. That prayer and ministry went all night. People were filled with the Spirit, discovered many spiritual gifts, and saw healings and reconciliations. Everywhere their teams went they saw God moving on the people in local revivals. Many revival movements swept the South Pacific islands. I was blessed to see some. God poured out his Spirit on children and youth in the Western Solomon Islands from Easter 2003. They loved to sing and pray daily in the church after school. God gave them visions, revelations, words of knowledge about hidden sins and bad relationships and many other spiritual gifts such as healings and speaking and singing what God revealed. We saw God touch around 1,000 youths at a National Christian Youth Convention in 2006. One night at the convention they responded, running to the front of the open-air meeting. For half-an-hour their worship team sang “He is Lord” while we prayed for them. They fell like dominoes. Many testified to healings, visions and revelations. One young man returned to his village that night and found his mother ill, so laid hands on her and prayed for her. She was healed. His brother then asked for prayer and he too was healed. The young man had never done that before. A whole group from the Kariki Islands, further west, saw revival in their islands on their return. God moved powerfully in every meeting they held and in personal prayers. The church leaders in one village on Simbo Island told me how their prayer teams of about 20 people always pray for the sick. The medical clinic on that island has no entries for anyone from that village, except for babies born, since they started praying like that. 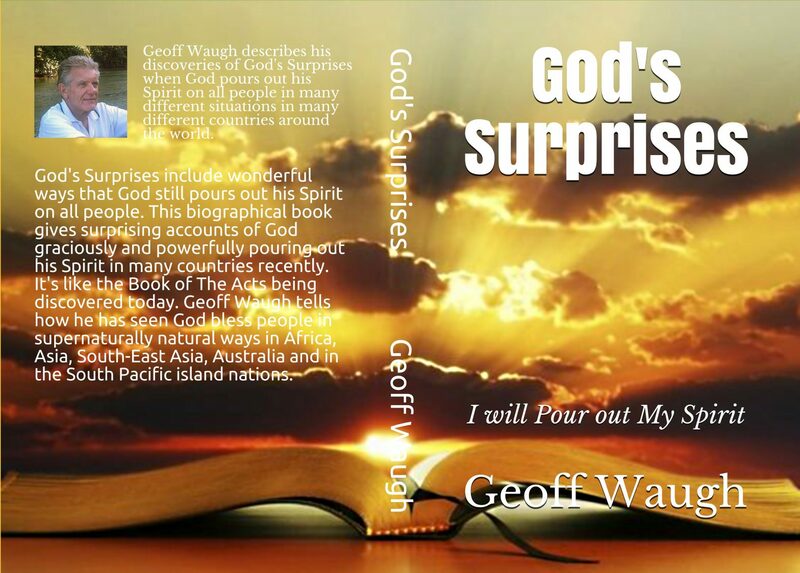 I visited Vanuatu often from 2002 and saw many prayers answered and revival movements. Here are just a few examples. God’s Spirit fell on the Law School of the University of the South Pacific just after Easter 2002. The Law School is in Port Vila, the capital of Vanuatu. Many law students were dramatically saved and transformed at their open-air rally. Those committed students went on missions to other South Pacific nations and to Australia with me. We saw large numbers saved, healed and filled with the Spirit. At a service in Port Vila, a nurse, a nurse told how she had been on duty when parents brought in their young daughter who had been badly hit in a car accident, and showed no signs of life – the heart monitor registered zero. Leah was in the dispensary giving out medicines when she heard about the girl and she suddenly felt unusual boldness, so went to the girl and prayed for her, commanding her to live, in Jesus’ name. She prayed for almost an hour, and after an hour the monitor started beeping and the girl recovered. Our revival team, on Pentecost Island, including the two of us from Australia, trekked for a week into mountain villages. We literally obeyed Luke 10 – most going with no extra shirt, no sandals, and no money. The trek began with a five-hour climb across the island to the village of Ranwas on ridges by the sea on the eastern side. We prayed for people many times in each meeting. At one point I spat on the dirt floor, making mud to show what Jesus did once. Merilyn Wari, the wife of the President of the Churches of Christ, then jumped up asking for prayer for her eyes, using the mud. Later she testified that the Lord told her to do that, and then she found she could read her small pocket Bible without glasses. So she read to us all. Meetings continued like that each night. I heard the sound of angels singing about 3 am in a remote village. It sounded as though the village church was packed. The harmonies in high descant declared “For You are great and You do wondrous things. You are God alone” and then harmonies, without words until words again for worship “I will praise You O Lord my God with all my heart, and I will glorify Your name forevermore” with long, long harmonies on “forevermore”. Just worship. Pure, awesome and majestic. The team stayed two extra days there – everyone received prayer, and many people surrendered to the Lord both morning and night. Everyone repented, including us, as the Spirit moved on us all. I was part of two teams from Kenmore Baptist Church (now Riverlife) in Fiji with Ric & Ann Benson, and Jesse and Cooky Padayache. Many were saved and healed. Jesse prayed with a sick man in the hospital, and then everyone in the ward asked for prayer. They were all discharged within a week. I prayed for many people there then and also in other visits. At one revival meeting, everyone I prayed for said their pain had gone. Two partially blind boys told their parents that after prayer they could see clearly. Benin, West Africa: high school boy defeats voodoo attacks in Jesus’ name. Voodoo priests sent talking birds to take Christian down. Benin: high school boy defeats voodoo attacks in Jesus’ name. Voodoo priests sent talking birds to take Christian down. Nestor Kouassi today in America. Nestor got introduced to the gospel even when there wasn’t a single Christian church in his village of 1,400 people. His nation, Benin, holds the dubious distinction of being the worldwide birthplace of voodoo. Even the name of his village was a satanic incantation. People feared the voodoo lords, and Christianity couldn’t crack the town. The witches had a technique they called a “spiritual gun” and the victim target of their incantations would writhe in pain. But the gun didn’t work on Nestor and his buddies, he said. “In this battle, you will definitely see Jesus,” he responded to their threats. That night, Nestor did indeed confront demon spirits, but ultimately they could do him no harm. “I saw the power of witchcraft. I was in my room at midnight. I closed my eyes. All of a sudden, I heard hundreds of birds flapping in the room. They were talking in human voices. They said, ‘Take him.’ I could feel people’s hands. They tried to lift me off my bed. But I became so heavy, they couldn’t. They tried and tried and they left,” Nestor says. It was worse than Alfred Hitchcock’s famous horror movie, The Birds. “I opened my eyes, got up, and said, ‘Whoa, what is going on? What is this?” Then they came back with the chief priest who said, ‘Who is this little boy that you can’t get him?’ The same birds flapping, the voices, they couldn’t take me,” he says. The next day at midnight, there was a great commotion in the village. The chief voodoo priest lost consciousness in his house. Thirteen hours later, he was pronounced dead in the nearest hospital. Since those times, Nestor and his wife immigrated to America with student visas. Cyrille lives in Grand-popo and farms. Valentin is an accountant in a big company. May God receive the glory for all He has done! Michael Ashcraft was a missionary for 15 years during which he founded the Liceo Bilingue La Puerta Christian school in Guatemala. It was long enough for him to see firsthand enough witchcraft to believe his friend, Nestor, when he recounted his conflict with the voodoo lords.